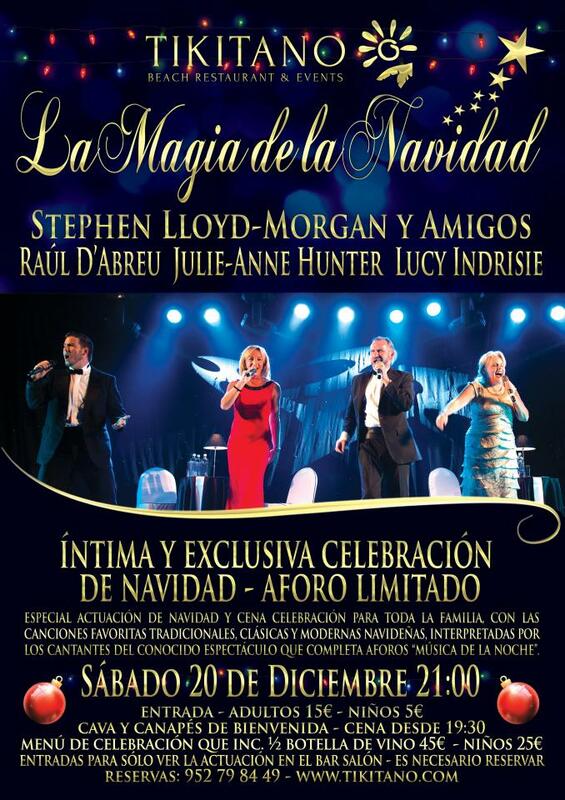 ´The Magic of Christmas´ at Tikitano – Saturday 20th December – Stephen Lloyd-Morgan & Friends | Marbella Marbella – Adelante! 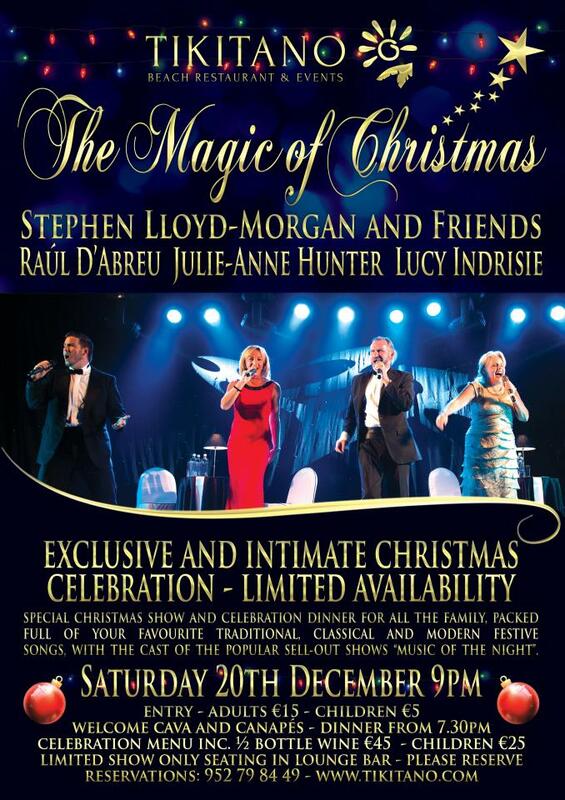 Exactly a year to the day since last performing at Tikitano, we are delighted to have tenor Stephen Lloyd-Morgan and his friends; some of the cast of the largely popular and recently sold-out shows “Music of the Night”, which has performed to large audiences of 500 to 1000 throughout the year, return for an exclusive and intimate Christmas show. The special show and celebration dinner for all the family, will be packed full of all your favourite traditional, classical and modern festive songs! In 2013, Stephen´s productions, “West End Musicals in Concert”, “Encore! The 3 Tenors” and “The Best of Broadway” performed on 20 dates here at Tikitano, and were the most popular shows of the year! We are therefore especially pleased that Stephen along with the equally talented and amazing voices of Raúl D’Abreu, Julie-Anne Hunter and Lucy Indrisie have agreed to return for this ´one night only´ exclusive Christmas show. We are very much looking forward to welcoming everyone back to Tikitano after a year of transformations; including a refurbishment of the bar, kitchen and restaurant; with a superb new chef and exciting new menu. Welcome Cava and Canapés included. 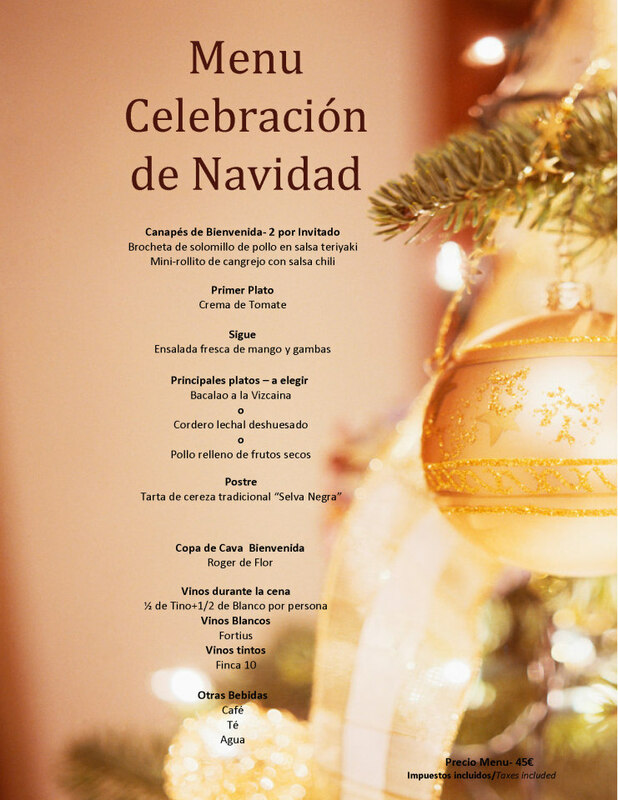 Celebration Menu – including ½ bottle of wine per adult (see below) €45, children €25 – (both excluding show entry). Dinner can be booked from 7.30pm, with the show starting at 9pm. There is limited seating for both the dinner and lounge bar area ´show-only´ entry, so we highly recommend advance bookings.